No stuff in the tagging section about you are tagged if you are reading this. You legitimately have to tag 11 people! 1 - I was born with the umbilical cord wrapped around my neck 3 times. I think that explains some of my ditziness! 2 - I am addicted to any Real Housewives. ADDICTED. It's really sad. I will watch the same episode over and over and over again! GAHHH I love the drama. I can't help it. Except Atlanta. I do not watch Atlanta at all--they are too ghetto for me! And one Sunday last December, I met Paul and Adrienne from Beverly Hills! They were at our mall to promote Adrienne's new shoe line! 4 - When I was little, all I ever ate was lima beans! I was a strange child. 5 - I LOVE making lists! I make lists of lists of lists. Specifically, to-do lists. I currently have 3 to-do lists and 2 grocery lists on my phone; plus a school to-do list and a home to-do list on paper! Plus a wedding to-do list that has several sub-to-do lists to go along with it! 7 - I can't stand ranch dressing. It makes me nauseous. 9 - I am terrified of rodents. Mice, rats, hamsters, gerbils, you name it. Their tails sketch me out. And their beady eyes. 10 - I don't put milk on my cereal. It gets too soggy. Travis doesn't either...when I found this out, I knew we were a match made in heaven! 11 - If it is pink, preppy or looks expensive I either own it or want to immediately! What is your favorite vacation spot? I studied abroad in Spain summer after my junior year and I have wanted to go back so bad ever since! What are the 5 items you cannot live without? Definitely my phone, running shoes, water (I hate being dirty), makeup (can that count as 1 thing? ), and chocolate! Chocolate or Flowers? Chocolate alllll the way! What are you most proud of so far in your life? Obviously, I'm proud that I made it through high school and college and got a job; but most recently, I'm pretty proud of myself for running a half marathon! It was my first running race ever and I got 3rd place for my age group! What is favorite cocktail/drink of choice? Wine. Any type is acceptable except Chardonnay or reds. Polka Dot Reisling is my absolute fav, partially just because of the bottle! Do you prefer the beach or the mountains? Beach, although the mountains are super romantic! What's your guilty pleasure? Watching trashy TV shows (see above). What is your dream job? If I wasn't a teacher, I would want to open up my own cupcake shop. My specialty would be red velvet cupcakes with Carolina blue frosting! Oh wait, that's our wedding cake....but its kinda my fav! Ballet flats, boots, or heels? Ballet flats for sure! 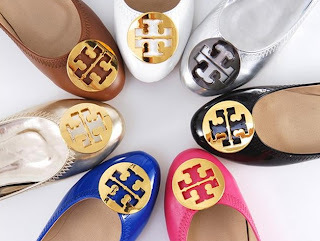 I live in my Tory Burch Revas!!!! Would you rather run outside or on the treadmill? This is so funny, because before I started training for my half marathon, I hated to run outside! But now, I love it! The treadmill gets so boring! I also love it even more now that we are living out in the suburbs and there are so many more great places to run than when we were living downtown! Who I'm tagging: Anyone who is reading this! :) Feel free to tag yourself!!! I could make lists all day long! I love it - I'll add something I just did to a list I've made just so I can cross it off! I really want to run a 1/2 marathon but it scares the crap out of me. So props to you!! Way impressive!